Wait a minute, your post was made at 1:23 am. Halflife 3 confirmed. To be honest, I kind of gave up on Half Life. It has been too long since the Orange box, and after I played Episode 2 I couldn't wait for 3 to release. And I waited, and I waited, and I waited. I would still love to see it come out though, but I kind of lost the enthusiasm about it that I once had many years ago. I'm all about great teasers and long awaited games (E.G. 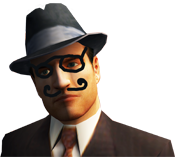 Mafia 2, Skyrim etc. ), but all prequels had enough closure to patiently await the next sequel. Unlike HL2 which showed with it's cliffhanger that "soon" the episode would continue. It was false hope. After so many years, other games and their universes have taken HL's place for my enjoyment such as The Last of Us, GTA V, Mass Effect and a lot more. Half Life is like that person you try to meet up with many times, but always finds an excuse not to come, so you tell yourself "**** him", he had his chance. This is such an accurate description, it's exactly how I think a lot of people feel.